A funny climbing lesson for kids at the Rock Master climbing Stadium in Arco. A couple of hours of game and adventure to free the children's natural ability of climbing. Kids still have inside the natural and instinctive need to push upwards: they climb on a tree branch or on a wall as soon as the have the chance to. In complete safety and under the supervision of a Mountain Guide they’ll have the chance to free this need, climbing on easy routes on the equipped walls and playing on the small aerial park inside the stadium to test their balance. A nice occasion to practice outdoor activity learning the basis of a new sport that can be they’re new passion. Each Guide can take care of maximum 6 people. 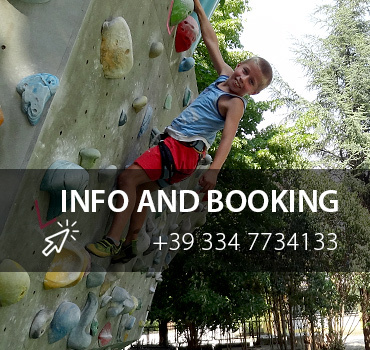 Included in the fee: the Guide service, the technical equipment hire necessary for the activity and the entrance ticket to the climbing stadium. Not included in the fee: All not specified in "included". Equipment provided by Mountime: harness and climbing shoes.